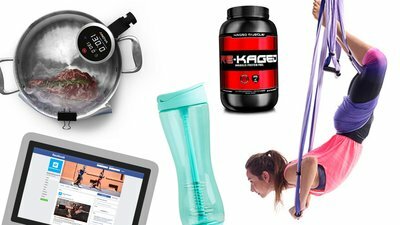 Shake up your hydration, spice up your meal prep, swing upside down, and "like" something you already love. We've got everything you didn't know your fit life needed! This is hands down my favorite water bottle. The tapered middle is comfortable to hold, the straw is easy to drink from, and the bottom has a rubber grip to keep the bottle from sliding around. The 24-ounce capacity lets me stay hydrated without hauling around a heavier bottle all day. It's also the best-looking water bottle I own; I get lots of compliments on it! As Bodybuilding.com's Facebook page attests, there is strength in numbers. The 3,242,290 people who like this page and 3,169,899 who follow it enjoy 12-18 daily fitness posts, including most of the articles you read on the Bodybuilding.com homepage. Your favorite fitness personalities host Facebook Live events up to four times a week. These include Kristina Olson and Mark Bell—but not Mark Zuckerberg, who is busy not running for president in 2020. Flex Friday live workout series, hosted each Friday by Mike Hildebrandt, aka "Trainer Mike"
The Bodybuilding.com Facebook page also shares content from relevant media brands such as Men's Health, Women's Health, Womanista, Spoon University, Fatherly, Ask Men, Greatist, and Men's Journal. What's more, you'll receive a heads-up on sales from your favorite brands. So if you haven't already, visit the page and click LIKE today. It's the perfect way to motivate yourself for your next workout. It's rarely newsworthy when a supplement company releases a new flavor of protein. But when it's Kaged Muscle, it is. Why? For one, because Kris Gethin's Re-Kaged Anabolic Protein Fuel rapidly cracked Bodybuilding.com's list of top-10 best-selling protein powders, even though it initially only came in one flavor: strawberry lemonade. Every other protein on that top-selling list comes in every flavor under the sun, and then some. And second…the new flavor is "Orange Kream." For some of us, that particular creamsicle-esque combination of orange and vanilla scratches a nostalgic itch that all the chocolate concoctions in the world can't touch. I'm talking a "stealing Dad's change to go chase down the ice cream truck" kind of itch. Re-Kaged doesn't just scratch it, but tears it down DTP-style, and rebuilds it better and more terrifying than ever. If you're into eating meat, why not cook it the most efficient, nutritious, and easy way? Anova's Precision Cooker uses a French technique called "sous vide" ("sue-VEED") that uses precision water-temperature control to cook foods. Here's how it works: You're looking forward to a nice steak for dinner. Before you leave work at the end of the day, you use Anova's phone app to tell the Precision Cooker (which you put in a container full of water before you left for work in the morning) to start heating the water up to exactly 129 degrees for your medium rare steak (the more well-done you want the steak, the higher the temperature). When you get home, you season the steak, put it in a Ziploc bag, immerse it in the 129-degree water, and clip it to the side of the container. Now go work out or help the kids with homework for an hour, and by the time you come back, the meat is perfectly cooked—pale red from edge to edge. If you want, you can sear up the steak on the grill, and you're good to go. Perfect steak (or chicken, pork, fish, corn, eggs—even cake) every time. There's nothing I love more than working on challenging yoga poses—well, except perhaps hanging upside down for spinal traction. Yoga Trapeze is great for people new to aerial workouts because it has a built-in hammock you can sit in and handles to hold. And it's a fun way to relieve back pain while still developing core strength and flexibility. The company includes an introductory DVD and instructions for at-home setup, plus a tote bag for bringing the trapeze with you to the park or gym.